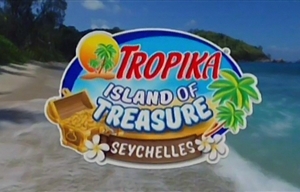 Tropika Island of Treasure is a South African advertorial-driven, promotional reality competition television series created by Samantha Moon and produced by KAP Productions and Stimulii (the first five seasons) and Quizzical Pictures (since Season 6) in which celebrities and ordinary people compete in remote, exotic locations in a variety of daily challenges to win a R1-million prize. The series began as a below-the-line promotion in 2008 with an insert on e.tv and two webisodes and became a full-fledged show for its second season, which premiered on e.tv on Sunday 18 October 2009, at 18h30. The show moved to SABC1 for Season 5 and to SABC3 for Season 7. The show initially comprised of ordinary South Africans being paired with celebrities on a desert island and sharing the winning prize of R1-million, but in Season 3 all contestants - celebrities included - stood an equal chance of winning the prize. In the show, the contestants live it up on desirable islands to experience the glorious lifestyle offered by the famed destinations, whilst competing for the R1-million. The contestants battle it out each week in exciting yet challenging games, with the losing contestant being eliminated in every show. In the finale, the finalists go head-to-head in a series of challenges with the ultimate goal of winning the R1-million. For the first four seasons episodes were half an hour long, but in Season 5 - when the show moved from e.tv to SABC1 - they were increased to an hour in length. Much hype was created around the fifth season, particular after the death of contestant Reeva Steenkamp, who was shot and killed by her boyfriend Oscar Pistorius two days before the show premiered. SABC1 opted to debut the show despite the tragedy. In Season 6 the show was radically reformatted and reduced once again to half-hour episodes, and the celebrity component of the show was discarded, with only "normal" South Africans taking part. Quizzical Pictures was appointed to take over the series from previous producers Stimulii. The first edition of the show was not a proper show - it was comprised of one insert on e.tv and two webisodes. It only became a full show from Season 2, airing on e.tv. It moved to SABC1 for Season 5 and episodes were increased to an hour in length. After a radical format overhaul, episodes were reduced in number and length (back to 30 minutes) for Season 6. This was an unpopular format and the show changed back to its traditional format (and hour-long episodes) when it moved to SABC3 for Season 7. CHANNEL: SABC3 | This year is set in the Maldives and is hosted by Katlego Maboe, with the usual mix of plebs and celebs. ... and people have to pay to audition for the show. Bah! !